The Doley sisters know there is a lot wrong with their Germantown block that they can't fix. They've been waiting most of their lives - 20 years, to be exact - for the city to tear down two burned-out houses on a corner. They accept that no one is coming out anytime soon to fix the block's heaving sidewalks, which look as if they sit atop a seismic fault, or to clear trash from the empty lots where homes of childhood friends used to stand. But if Aine and Emaleigh Doley can't make West Rockland Street what it once was, they figure they can at least plant flowers. While others lounged at the Shore Saturday or went for long bicycle rides on Kelly Drive, the two sisters were turning earth and carting flats of impatiens with their Rockland Street neighbors in a determined effort to beautify a little piece of struggling Germantown. All week, the Doley sisters had been talking up the project, which they billed as "Grow This Block," and to their delight several dozen neighbors came out at 8 a.m., ready to pitch in. "I know nothing about gardening, but I got one of their fliers, and here I am," Sharry Harper said as she raked mushroom compost across the postage-stamp-size lawn of her stone rowhouse in preparation for planting. A few houses down, Marsha Lewis was arranging a hosta in the center of a daisy-shaped planting bed. Her teenage sons had formed the fanciful pattern with pink scallop edging blocks, and she was busy filling in the spaces with "a little bit of everything." The front of the Doleys' house needed no such special treatment. It was already overflowing with jumbo peonies, budding hydrangeas, and romantically curved brick paths. Emaleigh, 27, was quick to credit Aine, 34, as the one with the green thumb. But the blockwide gardening marathon was a combined effort. After finishing college - Aine at Temple, Emaleigh at George Washington University - the sisters gravitated back to West Rockland Street while they pursued careers in public relations and marketing. The sad state of their old block pained them so, they decided to use their promotional and organizational skills to see if they could make it better. "People were always coming to Aine for gardening advice, so we thought, 'Why not organize a planting day?' " Emaleigh Doley said. 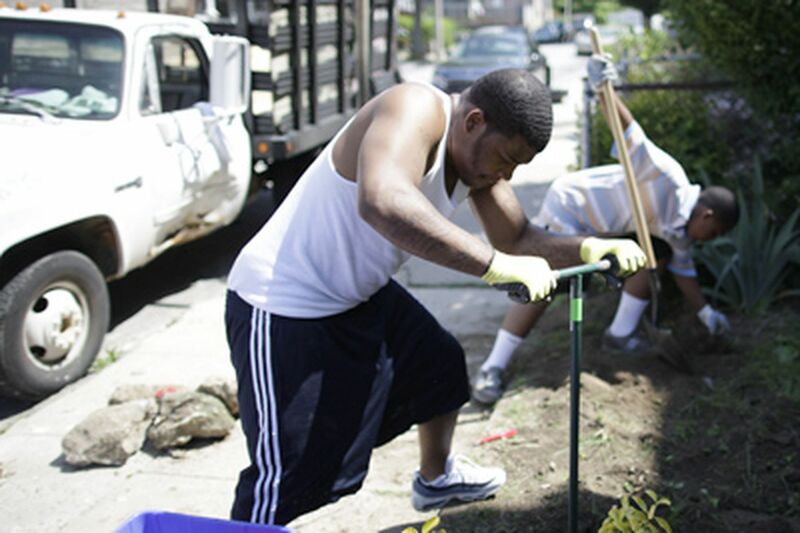 They began laying the groundwork for the neighborhood effort earlier this spring when they declared themselves "co-block captains" and participated in Philadelphia's annual cleanup day. With neighbors, they cleared the vacant lot at Greene Street - the one next to the burned-out houses - which was knee-deep in trash and dog waste. Being in public relations, they have been chronicling it all on a website (http://rocklandstreet.com/). "What one Philadelphia city block can do to change its future," boasts a subtitle. West Rockland Street is a lot different from when the Doley sisters were kids - more renters, more empty lots, more of the usual intractable urban problems. Since the recession hit, several of the five-bedroom houses have been foreclosed and cut up into apartments. More people are unemployed. Those are also problems the sisters know they can't fix. "But we're hoping this gardening will give people a new stake in the block," said Emaleigh. "It's another conversation starter. Some Rockland Street residents have always tended their front lawns meticulously, and magnificent rosebushes stand sentinel at the sidewalk. Others, Emaleigh said, lacked basic gardening tools. For Saturday's event, the sisters tapped their contacts for donations. The Pennsylvania Horticultural Society delivered a truckload of compost, which was dumped on the cleared corner lot. The Hansberry Garden and Nature Center, a few blocks away, offered plants at a discount. In preparation for the event, Aine grew hundreds of seedlings. By midafternoon, Rockland Street's drab stone houses were bursting with color. "Our goals now," said Emaleigh, "are to find a way to get new sidewalks. And street trees. There used to be big trees up and down the block." And after that, she said, looking wistfully in the direction of the burned-out houses at Greene Street, "maybe we can get these two torn down." Our attention spans are shrinking. Here’s why that matters.